All Greek-Roman writers since Herodotus stated India as rectangular whereas all Purāṇas tell it as inverted triangle which gave the name Kumārikā Khaṇḍa as viewed from south ocean. Mapping needs measure of 3 quantity (Tri-praśna) at key points on globe – (a) Longitude, (b) Latitude, (c) Direction (marking north). These need observing Nakṣatra in space in Spherical polar coordinates. Parilekha is a measure (Māpa), so it is Map. Uses Nakṣatra, so Nakshā. Measurement of latitude is considered easiest, but that needs accurate southern declination of sun or any reference star. Longitude needs accurate measurement of time hence its method was not known in Europe till 1480. Only after it was learnt from India via Turkey navy, Columbus could plan his America visit. Actually, an old map was stolen from Turkey from Admiral Piri Reis, which showed Americas and Antarctica. Provisions were kept only for visit to America about 2500 kms away, visit to India would have needed journey of 18000 kms. 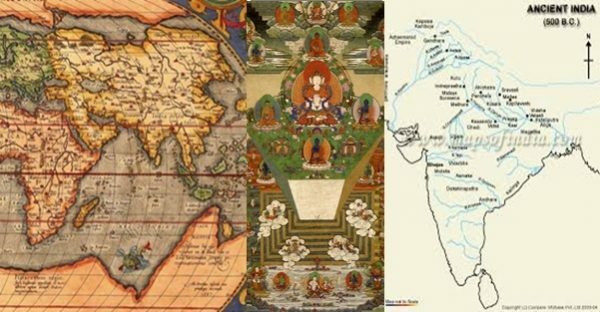 Maps of India by Europeans till 1780 showed India as rectangular. See link here. All Greek-Roman writers since Herodotus stated India as rectangular whereas all Purāṇas tell it as inverted triangle which gave the name Kumārikā Khaṇḍa as viewed from south ocean. Inverted triangle is called Śakti-trikoṇa and Kumārī is root form of Śakti. Megasthenes: Indika (FRAGMENT I OR AN EPITOME OF MEGASTHENES. (Diod. II. 35-42. ): India, which is in shape quadrilateral, has its eastern as well as its western side bounded by the great sea, but on the northern side it is divided by Mount Hemodos from that part of Skythia which is inhabited by those Skythians who are called the Sakai, while the fourth or western side is bounded by the river called the Indus, which is perhaps the largest of all rivers in the world after the Nile. The extent of the whole country from east to west is said to be 28,000 stadia, and from north to south 32,000. Quadrant points-Marking 4 points separated by ¼ of circle-It is not clear whether 4 cardinal towns were built at distance of quadrant or after being built, they were found approximately at quadrant from each other. (1) Brahmā system (29102 BC) in Purāṇas. (2) Vaivasvata Manu system (13902 BC) in Sūrya-Siddhānta by Vivasvān (Sun). Rotation axis is Meru, north pole = Sumeru, South pole = Kumeru. North Hemisphere-4 quadrants in 4 colours = 4 colours of Sumeru faces. Bhārata petal in north-divided into 3 or 7 lokas like lokas in space. (3) Svah (Svarga)-Himālaya region in Bhārata is divided into 3 Viṣṭapa or Viṭapa (Tree, catchment area of river)-(a) Viṣṇu-viṭapa in west is drained by Sindhu river system-place of Vaiṣṇo Devī. Lakṣmī is daughter of Sindhu & wife of Viṣṇu. This region Kashmir is heaven on earth. (b) Śiva-viṭapa is region around Kailāsa-Mānasarovara drained by Gangā system-from hairs of Śiva. (c) Brahma-viṭapa is drained by Brahmaputra and land east of that is Brahma-desha (now Myammar = Mahā + Amara, or head among Devas). 3 Vitapas combined are Triviṣṭapa = svarga (Tibet). (4) Mahar-China is next part called Mahar as its people were called Mahā (Han) by Brahmā. In Arabic, mukul = preta = pra +itah (soul which has departed from body). Parallel to place of Mukul on earth is Mukul = Mangolia. (6) Tapah loka-Ṛṣīka deśa where Arjun had stopped his northward conquest. Śivira (Siberia-temporary tents in snow), Nivāta-kavacha (very cold place, wind cheaters used).Tapas has become Steppes. In space, average energy or temperature oh higher (bigger) lokas is successively lower. In Indra region also, lokas to north are colder. Other 7 petals (3 in north, 4 in south) are 7 Tala (or Pātāla), named differently in Purāṇas- Viṣṇu-Atala, Vitala, Nitala, Gabhastimat, Mahātala, Sutala, Pātāla. Brahmāṇḍa-Tatvala, Sutala, Talātala, Atala, Tala, Rasātala, Pātāla. Bhāgavata-Atala, Vitala, Sutala, Talātala, Mahātala, Rasātala, Pātāla. Plane projection of earth map will have infinite scale in polar region. That is not a problem for north hemisphere where north pole is in water. But south pole is land mass, whose scale will be infinite, so it is called Ananta and its map has to be made separately. 7 Dvīpas & oceans are actual land masses & natural divisions. Dvīpas are divided into Varṣa which are zones of Varṣā (rains). 2. Nearby Mount Kilimanjaro at 3°4′33″S, 37°21′12″E is in Kenya. Mount Kenya is at 0°9′00″S 37°18′00″E with nearby Meru Town at 0°03′N 37°39′E. There are Meru central and north districts, Maara district. Its people are called Ameru, their language is Kimiiru. The forest region is Meru National Park. 3. Meru, Hazaribagh, a small town in Jharkhand, India, 24°1′46″ N, 85°27′26″ E. This is almost at old Karka rekhā and about 100 east of Ujjain, thus a local reference. 6. Méru, a commune of the Oise département in France 490 14’N, 20 8’ E- about 73045’ west of Ujjain or 12 time zone west. Place of Time zones are places of Śiva called Mahākāla at Ujjain at central longitude. Similarly, town near Greenwich longitude here is called Lourdes (Rudreśa) at 4306’ N and 003’ E.
10. Mount Sumeru of China at 36°01′N 106°15′E is of red sandstone like colours of Meru in Purāṇas. It is full of minerals. Like present time-zones at interval of 30 minutes, ancient time zones of world were at intervals of 60 or 24 minutes (=1 daṇḍa). These were places of sun, Lankā, of places of time (Kāla). Central place of time was Mahā-kāla (Great time) in Ujjain, whose central point appears to be point on prime meridian. Kālahastī in Andhra Pradesh is 60 east of Ujjain. Koṇārka at east coast in Orissa is 120 east of Ujjain. Kālapriya (Kālapī in Uttar pradesh) and Mūlasthāna (Multan in west Punjab) are at 00 and 60 west. Lolārka in Vārāṇasī and Puṇyārka (Punarakh near Patna,Bihar) are also 60 and 90 east of Ujjain. Thaneswar is at 00 long. Puṣkara (present Bukhara in Ujbekistan) was 120 west of Ujjain as per Viṣṇu Purāṇa (2/8/26). Kyoto (old capital of Japan, 600 east), Pyramid of Ezypt (450 west), Ancient capital of Inkā (Ina = sun in Sūrya-Siddhānta) in Peru is 1500 west-all were places of kings of sunrace. Stonehenge in England was 780 west (13 time zones). It was place of observatory and its region is called Lancashire, Lancaster. Lourdes (=Rudreśa) in France onits east border is old holy place and is 720 west (12 time zones). Hellespont (helios = sun) is narrow sea between old south Greece and Turkey, now called Dardanelles. This and places in Turkey-Izmir (Meru) and Canakkate (Koṇārka = place of arka=sun) are 420 west. (a) Guntur-Guṇṭha = small area, measure rods linked together. (b) Ranchi-Zero ref point (RD)-town measures from this place. (c) Karachi-RD point for ocean distances (Ka = water). (d) Other RD points-Kumbhakoṇam-Kaveri Delta is Kumbha (water pot), Its mouth is Kumbhakoṇam (koṇa = angle). Konkaṇa or Koṇagaḍha (like Koṇārka)-Reference of map or time zone. Kanyākumārī-End point of Kumārikā Khaṇḍa (Bhārata as inverted triangle). Kumārikā in ocean in south hemisphere (now called Indian ocean in same sense). Fahien had expressed surprise that the Indian ship from Tamralipti to China carried 1500 persons and did not follow coast line. It could navigate in deep sea and new locations of turning points like Andaman and Singapore. (a) Uru, (b) Pura, (c) Meru, (d) Vajra, (3) Śrī (Trikoṇa -Thiru) – All these provide for drainage of water. Uru is like Urvī (earth sphere) whose central point is topmost (Bangaluru, Mangalore, Nellor, Chittur of AP, Chittor of Rajsthan). Pura is rectangular matrix of roads. Drainage from one side of rectangle to opposite side. Meru has shape like 4 faced pyramid of Meru mountain, but very gentle slopes (Ajayameru = Ajmer, Jaisalmer). Vajra is on both sides of a river. Triangles on both sides join to form a rectangle with river as diagonal. Old Vajra town is Basra of Iraq. Śrī is in shape of Śrī-yantra = nine concentric circles with central point at top sloping down outwards-Srinagar in Kashmir, Garhwal, Srividyanagara (Vijayanagara), Tiru-anantapuram. Tiruchirapalli. Lankā-long in north south on Ujjain longitude-Lanka = chilly in Bengal, Odisha. All astronomy texts tell it on same longitude as of Ujjain. Present Srilanka was Simhal, politically part of Lanka in time of Ravana. Kerala= Chera (at root of country)-name of a kingdom, vegetable of this shape = Karela. Himalaya in crescent shape, so Bhārata is Indu = Inde (India)-Huensang. North boundary of Jambū-dvīpa also like that. Krauñcha (Heron) dvīpa-Shape of north America. This has been called west of Meru and in north (Mahābhārata 12/14/21-25, 16/25). Bṛhat Samhitā and Rāmāyaṇa locate it in north. Thus it is North America which has Rockies mountain in same shape of a flying bird (krauñcha). Featured image courtesy: Wikipedia, Maps of India, and Pinterest.